Actually yesterday’s. I spent the day thinking about it. I played nine holes, and was two over par for six of them, and seven over, two doubles and a triple, for the other three. That will make you think. Now there is no “if only” in sports. I shot what I shot. But looking over those three high scores, the pattern was that I lost four strokes because of bad decisions. The problem is that I have forgotten how to play golf. Playing golf is not about hitting good shots. I can do that. Golf is about hitting as few of them as possible, and that’s a different skill. So let me go over my errors with you so you can see if that will help you start thinking about how to shoot a lower score with the same skills. The 5th hole is 505 yards long. A drive and a hybrid put me right in front of a wide-open green, between an eight and nine-iron. I chose the eight because I always want to have enough club in my hand. So far, so good. But I forgot what you do when you choose the longer club: grip down and swing fully. Gripping down takes about five yards off the shot. Instead I tried swinging a little easier, which makes bad things happen, and sure enough, I chunked it. The ball was close enough to the green that par was still in play if I could chip on and sink the putt. But I forgot the Maxim of the Short Game: just get the ball on the green so you can start putting. I got too cute with the chip by going for the pin instead of the green and chunked it. One chip and two putts later, I’m in the hole with a DB. The very next hole, a long par 4 into the wind, was a bogey hole that day. A drive and a seven-iron later I’m close to the green. Simple pitch, two putts, maybe one, and I’m happy. But I forgot to check the distance to the pin. Because of the wind I chose a stronger club to pitch with, but the pin was too close even for that, and I flew the green with my pitch. It took me three shots to get down chipping to a green sloping away from me. DB. Three holes later, the ninth, I hit my drive into the right rough. I had been pushing my driver all day, but getting away with it. The ground rises dramatically to the green, and given my lie I didn’t want to try for the green, come up short, and end up with the ball on a severe upslope. So I played short, leaving the ball on a moderate upslope, which was all I could do. This time I checked the distance to the pin, but didn’t evaluate the situation correctly. When you pitch off an uphill lie, the slope adds loft to the club. You have to club down to hit the ball the same distance. But I started my calculation with the club I should have ended up with, and once again had too much club in my hand. The pitch flew the green into a bad place and it took me four to get down from there. TB. Three bad decisions cost me four strokes. I ended up with a 45 that could have been a 41 without playing any better, but just by thinking more clearly. Let me give you one more example from that day’s round, by one of my playing partners. On the eighth hole, we both put our tee shots in the right rough (I ended up with a par). His ball was right behind a small tree trunk with about four inches to spare. He had the easiest shot in the world to chip 90 degrees back into the fairway so he could hit on. So my question to you is, do you think about your mistakes? Write them down? Learn from them, so next time you know what to do? Not just think, “Why did I do that,” but know now what you should have done, and next time apply the correction? I truly believe that if you concentrated only on playing the game better you could reduce your average score by over five percent. That doesn’t sound like a lot, but do the math. Hint: most mistakes come from getting greedy. We won’t concede one lost stroke and end up taken two or three more instead. In the summer of 2012, following two back surgeries earlier that year, all I could do was chip and putt. So I decided to start over with that and learn how to do them both the right way, not the way I had fallen into on my own. I had a chipping lesson that June. I told the pro, pretend I’ve never hit a chip shot before and tell me how to do it from the ground up. That’s exactly what he did. Whenever I have a golf lesson, I take notes afterward. I wrote down the points he made on chipping, practiced them a lot, because, remember that’s all I could do at the time, and I became a very good chipper. I looked through the blog and found out that I had never posted the points he taught me. They don’t really substitute for a lesson, but here they are anyway. I hope you can make something of them. There are six. 1. Setup: The ball is in the center of your stance, weight is slightly left, the clubshaft leans slightly left. Light grip pressure, grip down to the metal for control. 2. The wrists break back slightly when the club goes back. Do not overdo this. 3. The shaft and the right knee feel like they are moving forward together. 4. The right knee continues breaking through the shot. The right heel comes off the ground. 5. The hips turn. There is no slide. The left hip moves straight back, not around. 6. The wrists are straight again at impact and do not break further (the right hand does not pass the left). The clubface ends up facing the sky. As I have said earlier, think of sliding the sole of the club underneath the ball, not so much on hitting down on the ball. There is a bit of that, but do not emphasize it. If you perfect this stroke, and calibrate a number of chipping clubs, getting up and down from greenside will become your expectation. Lately I’ve been trying a little putting stroke for short putts—under six feet. It’s a short, wristy stroke. I figure the reason we miss short putts is that the putter wobbles at some point going back and forth before it gets to the ball. By then, the face is no longer aimed at the hole, and the ball slides by. The key, then, is to keep the face square to the starting line at all cost. So I started by taking the arms and shoulders out of the stroke. They can wander. Then I took the hands out of the stroke. They can twist and turn. All that is left are my wrists. Just a slight bit of horizontal hinging is all I need to get the ball going. The putter goes back maybe thee inches and about that on the follow-through. Since the only things moving are your wrists, and they can only hinge around a fixed axis (law of anatomy) there really isn’t much that can go wrong. And with such a short stroke, the face stays square without having to deliberately hood the face going back, then undo that coming through. If you have read the putt correctly and aimed the face square to the starting line, the ball will go in. Now here’s the important part. This is not a pop stroke. It’s not a jab. It’s a relaxed stroke that takes the head back gently and brings it through gently, but with a little “hit” on the ball. Just a little. These are short putts, so you don’ t need much hit at all. If you find yourself popping the ball anyway, hold the club very lightly. It’s hard to be poppy with such a light grip. Try this on your carpet at home. Remember, wrists only, gentle back, gentle through, with a tiny bit of hit. A little while ago, I was watching Johnny Miller’s tape, Secrets of Success. One of the segments is on how to hit short irons. Miller says to break your wrists early on the backswing, earlier than with longer clubs. I thought I would try this backswing with pitching clubs. You break the wrists almost as soon as the club starts back, and let the break release naturally as the club comes into the ball. I get clean contact, nice ball flight, and a dead straight shot. Over and over. This stroke is much better than trying to adapt a full swing backstroke to pitching. This video shows the difference at 0:30. 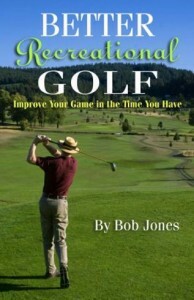 The March 2019 edition of Bob’s Living Golf Book is now online. The new text is in blue, and now that the weather is letting me play again, I have been inspired to write lots of new stuff. I hope you like it. Manuel de la Torre, born in Spain and located professionally in Milwaukee, Wisconsin, was a teacher of the Ernst Jones method, with a worldwide reputation. 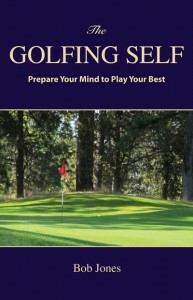 His book, Understanding the Golf Swing, reduces that method to its simplicity. The fundamental concept of this approach is that it is the movement of the club that is important, not the movement of the body. Once the movement of the club is understood, the body will respond in a way that allows that movement to occur. We don’t learn technique to make the club move in a certain way. We learn how the club should move in order for us to learn how to move our body. The method is simple, because there is less to learn, and hence think about, and hence get confused about. The method also has the benefit of taking our mind outside ourself, which is the external focus that Gabrielle Wulf has shown to be much more effective than thinking about what the body is supposed to do (internal focus). Jones wasn’t, and de la Torre likely wasn’t aware of Wulf’s work, but it confirms of their conception of the golf swing. Because the Jones method does not emphasize technique, this book reads differently than almost every other instruction book you have read. It takes a few readings to discern the depth of the message and understand exactly how to do what de la Torre is suggesting. For example, he says that the club is to be taken back with the hands, but swung forward by the arms. By arms he means the anatomical arm, the upper limb from the shoulder to the elbow. The forearm, from the elbow to the wrist, is not involved. A few days before I had looked at Phil Mickelson’s short game DVD, in which he talks about the “hinge-and-hold” method of chipping. I use that method on occasion, but he said to use it all the time. So, I used it all the time and got some really good shots out of it from sticky situations, like having to fly a bunker from in close but with little green to work with on the other side. I’d suggest you find a copy of that DVD and study it. 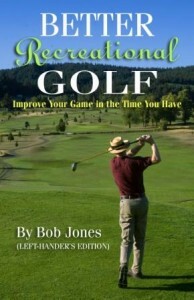 It’s the same stroke that I call the Air Chip on page 63 in Better Recreational Golf. My putting wasn’t as deadly as it was last week, but it didn’t hurt me. I played with just one other guy and we left the pin in the whole time. I love that new rule.